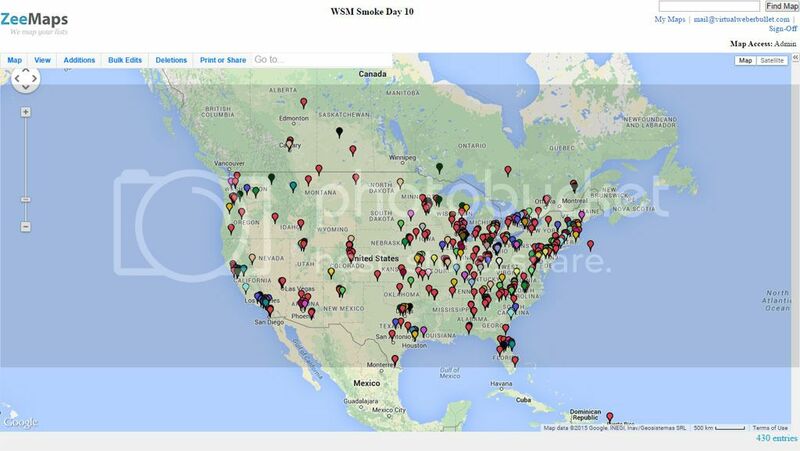 If you'll be participating in WSM Smoke Day 11, pin yourself on the Smoke Day Map! Click "Add Marker - Simple"
Wow, time flys. Seems like I just did this for Smoke Day 10! Done. Columbus OH representing. I am guessing I won't be the only one from some of the others I have seen on here. I'm in. Pulled Pork, baked beans, beer bread, beer dip, poppers, and a pie. Chris, in trying to add a pin using my tablet I inadvertently added a duplicate just west of Winchester, VA and north of Harrisonburg. I can't find a way to delete it. Can you remove it? I am new to the forum, but I plan on getting in on this! I just noticed the Smoke Day 11 gear added to the TVWB Cafe Press site... I might even get a t-shirt! I will do brisket and butts and moinks. Sides are up to wife and guests. Can't wait. This years shirts rock....I'll get the brown one this year.